Fits most wheelbarrows and small lawn and garden equipment. 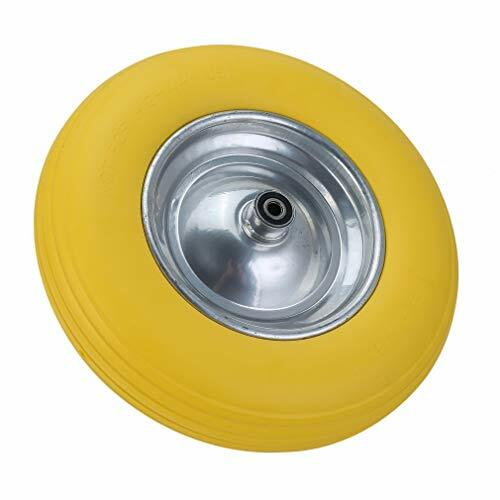 Features a ribbed tread that is easy to maneuver, a solid white wheel and a load capacity of 450 pounds. Flat-free tires keep your equipment rolling over the toughest conditions any job site can throw at you, eliminating costly and inconvenient flat tires. These flat-free tires are non-marking and have the bounce and feel of pneumatic tires without ever getting flat. Has the same feel and handling of an air-filled tire, but guaranteed to never go flat. 450 lb load capacity. Inflate with manual pump only. Not for highway use. Perfect for Contractor Wheelbarrows.Light weight, save material, heat insulation and sound insulation.